ABC: A leaked NATO report has provided further evidence that Pakistan’s ISI security service has been helping the Taliban. The report, which will further strain ties between Western powers and Islamabad, is the result of interrogations of thousands of Taliban and other insurgent fighters. The insurgents told their interrogators that the Taliban was increasingly confident of regaining power once US forces leave in 2014, and said Pakistan was positioning itself for that outcome. A NATO spokesman in Kabul confirmed the existence of the report, which was reported by Britain’s Times newspaper and the BBC, but said it was not an analysis of the military campaign. “The classified document in question is a compilation of Taliban detainee opinions,” said Lieutenant Colonel Jimmie Cummings, a spokesman for the NATO-led International Security Assistance Force. Pakistan has denied any link with the Taliban, and says claims contained within the report are not new. Pakistan’s foreign minister Hina Rabbani Khar, who is in Kabul on a fence-mending mission, says her country has no hidden agenda in Afghanistan. “I think I can just disregard this as potentially strategic leak – this is old wine in an even older bottle,” she said. She added that the neighbours should stop blaming each other for strained cross-border ties. Relations between Pakistan and Afghanistan have been tense since the assassination of a peace envoy and former Afghan president – an attack the Afghan government blames on its neighbour. For years the US has argued that Pakistan’s ISI has been providing support to the Taliban in Afghanistan. It has also been pressuring Pakistan’s government to do more to stop cross-border raids by the Taliban. Large swathes of Afghanistan have been handed back to Afghan security forces, with the last foreign combat troops due to leave by the end of 2014. But many Afghans doubt their security forces can maintain control once the foreign troops leave. Meanwhile, the Taliban denied reports that it would soon hold talks with Mr Karzai’s government in Saudi Arabia to end the war. “There is no truth in these published reports saying that the delegation of the Islamic Emirate would meet with representatives of the Karzai government in Saudi Arabia in the near future,” said a statement on the Taliban website. Afghan officials had suggested that talks in Saudi Arabia would be in addition to contacts in Qatar between the Taliban and the United States. But it was never clear whether the Taliban, which has resisted talks with the Afghan government, or the Saudis, who have made involvement conditional on the Taliban renouncing Al Qaeda, would come on board. 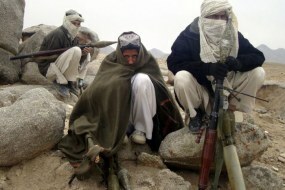 Taliban negotiators have begun preliminary discussions with the United States in Qatar on plans for peace talks aimed at ending the war. But they said in their statement on Wednesday that they had not yet “reached the negotiation phase with the US and its allies”. “Before there are negotiations there should be a trust-building phase, which has not begun yet,” the statement said. ← What if the Eurozone collapses?